Every beautiful landscape started with a carefully made design. And, most great designs come from landscapers with years of experience. McAfee Mowing and Landscaping, Inc can provide the creative insight and guidance you need to come up with the perfect design for your residential or commercial property. When you’re ready to start brainstorming, just let us know—we’re eager to hear your ideas for your new landscape. Along with landscape design in Kentucky, our contractors offer a variety of other useful services for those interested in revamping their lawns or backyards. Be sure to follow up with our construction team after your design consultation—we can handle almost any softscaping or hardscaping installation project. Additionally, we specialize in designing athletic fields and equestrian landscapes. 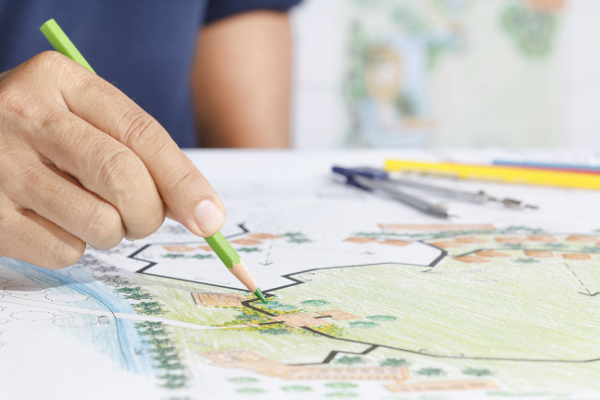 Though our designers have the resources and experience needed to create any landscape design concept from scratch, we want to ensure your personal preferences (if any) are incorporated wherever possible. To that end, we hope you’ll sit down with our team and discuss your goals for your new landscape. However, you can also be as hands-off as you like—we understand that your schedule is busy, and we know we can do right by your lawn. Contact our team to start creating your unique landscape design. We proudly serve clients throughout Central Kentucky.